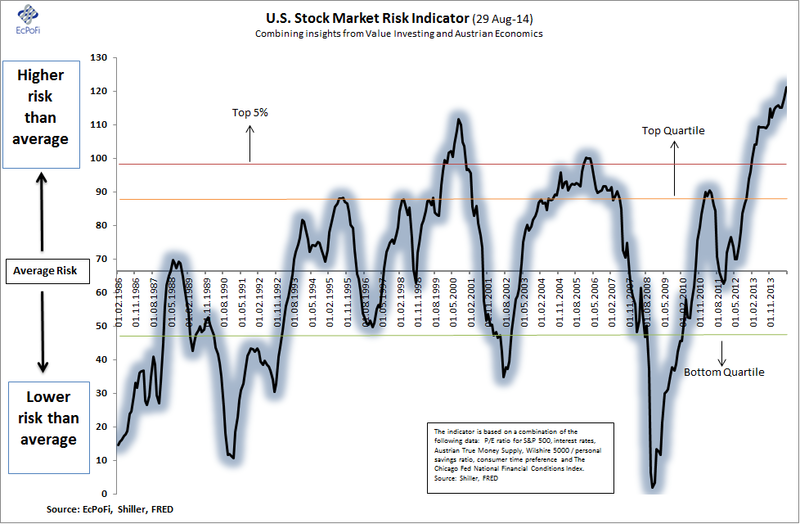 According to this stock market risk indicator, developed by combining insights from the disciplines of Value Investing and Austrian Business Cycle Theory, the risk of a future U.S. stock market decline (or the probability of poor future returns) became even bigger during the course of August. The indicator now signals the U.S. stock market has never been more risky to invest in (i.e. go long) than it is today based on data going back to 1986. The increase in risk during August was largely driven by a stock market that became even more expensive and a slowing growth rate in theÂ money supply.